Polished concrete floors are common nowadays in residential properties.This is unlike before when such floors could only be found in public spaces such as lobbies of office buildings and malls. One reason for its popularity is because it lasts longer than other types of flooring. While a tiled floor may last 10 to 20 years, a polished concrete floor will serve for more than 100 years. Plus, they are easy to maintain and are more beautiful. Their durability also means you save money in the long run. And another way to save money is to polish your concrete floor by yourself. If this is anything you’d consider doing then read on – here’s all the information you need to let you polish like a pro. Just as any other specialized skill like concrete cutting, core drilling and wire sawing, concrete polishing is a multi-step process that requires the use of the proper tools and equipment to get better results. To help you get started, here’s an overview of concrete polishing basics. Concrete polishing can be likened to wood sanding. You need polishing machines fitted with diamond abrasives just like sandpaper. The rough surface with diamond abrasives is what polishes the concrete surface, bringing out its desired level of smoothness and degree of shine. Just like in wood sanding, work the surface gradually. Start with an abrasive with a coarser grit and proceed to one with a finer grit to achieve a glossy finish. Grit refers to the diamond particles on the coarse surface of the tool. Note that concrete diamond abrasives come in different grits. Use a low-grit abrasive and progress to a high-grit abrasive for a lustrous, mirror-like finish. A low-grit abrasive is typically a coarser and more aggressive tool. A higher-grit diamond abrasive such as a 3000 grit tool on the other hand is more even and produces a high shine and glossy look. There are two primary methods of polishing concrete: wet and dry polishing methods. This method uses water to cool the diamond abrasives. The water acts as a lubricant and reduces friction between the diamond abrasives and the concrete surface you are polishing. There is no dust produced in this method and with the lubrication, the polishing plates are likely to have a longer service life. The diamond segment is often bonded to the grinding disc using a resin that can melt at high temperatures. The water therefore keeps them from melting by controlling their temperatures and increasing their lifespan. Wet polishing ensures no silica dust (potentially harmful to health) goes into the air. But this method produces mud from the mixture of the ground concrete dust and the water. You have to clean up the mud and dispose it in an environmentally sound manner. Wet polishing can therefore be a slower option and may also be messy for interior spaces in homes and retail setups. No water is used in this method. 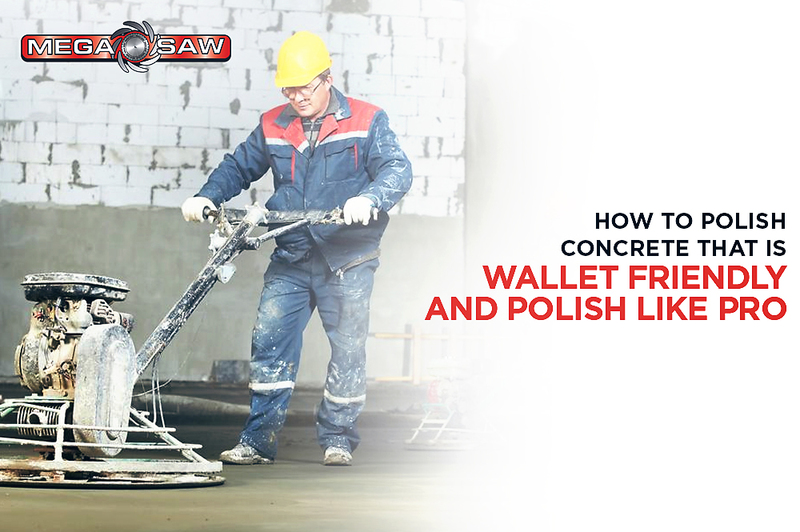 The plates are designed to withstand the high temperatures generated while polishing concrete. Though the technology also allows the disc to withstand the friction, it reduces its lifespan nonetheless. Dry polishing machine has a vacuum system for dust containment. This is therefore a more convenient polishing method and increases productivity by reducing downtime for commercial purposes. 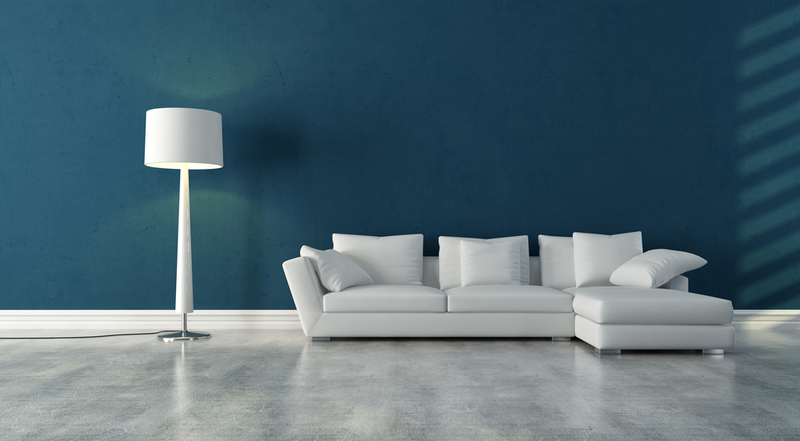 It’s also convenient for concrete polishing in interior spaces. The vacuum system however won’t capture 100 percent of the dust produced. Some of the harmful silica dust may remain on the floor and may get into the air as people walk on it. Now that you know about the wet and dry polishing, you can decide which suits you. Regardless of the method, here’s the procedure to get the job done. Use a MOHS concrete hardness tester.to evaluate the concrete’s surface before you polish. Before polishing, the concrete’s surface must be clean. Mop it and removing coatings and sealers if any. If it has thick coatings, consider using a 16 or 20 grit diamond abrasive. As a rule of thumb, the more aggressive the tool, the better and more suitable it is for coating removal. After removing the coatings, repair the surface by sealing any crack and joint. Use an epoxy or other semi-rigid filler. But in case the floor has only very light coating or minor blemishes, this phase won’t as necessary or elaborate. You can simply proceed with the initial process of floor grinding. For this initial polishing, use of a low-grit abrasive. Start with a 30 or 40 grit metal-bonded diamond. Then, proceed to grind with an 80 grit metal-bonded diamond abrasive. This will be your initial rough grinding, which prepares the concrete for its final smoothing. As noted earlier, concrete grinding is a multi-step procedure. It usually has three or four steps, depending on the condition of the concrete. It’s helpful to apply a liquid chemical hardener to the concrete after the initial grinding. This will help densify and solidify the surface for a better polish and extra protection from staining and penetration of water. Use a 100 or 200 grit resin-bond diamond to polish, then progress to polish with a 400 grit resin-bond diamond and finally with an 800 grit resin-bond diamond. Like grinding, polishing is a multi-step process, depending on the condition of the concrete. You may finish with a 1500- or 3000-grit resin-bond diamond. This will result in a lustrous finish, depending on your desired level of sheen. This is optional. You may apply a stain guard to help shield the polished surface. This makes it easier to maintain. Each concrete polishing job presents a different set of conditions and challenges. Don’t be discouraged. Instead, deal with it with the end result in mind so you’ll have the desired finish.